Waffles are well known not only for being delicious, but also for having a distinctive shape. Every delicious pocket waits to be filled with syrup, powdered sugar or anything else eaters can come up with. But would it still be a waffle without the pockets? The Nordic Ware Egg Waffle Pan says yes. 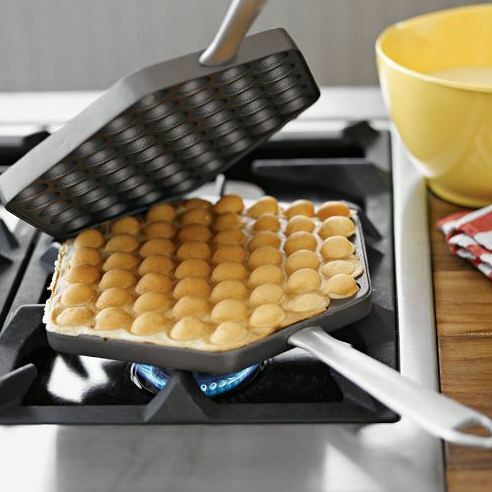 The uniquely-shaped pan creates inside-out waffles, better known as ‘egg-waffles’. Instead of drowning waffle-pockets in syrup, the idea is to roll it up–with or without a filling–and take it to go. Or better yet, tear apart the individual ‘eggs’ and share for a unique snack.